Man, the beginning of the year is the worst. The weather swings high and low, the sickness comes, people are on the last legs of their SADD dampened moods, and the theatrical releases are a piddling mess of mid-budget garbage and Oscar runoff. So, I'm having a problem with The Secret World of Arrietty. See, all that stuff means that consequently? I get lazy. I fall out of my movie watching habits, exchanging weekend matinees for books, paid work, and seasons of streaming TV. When a film does manage to pique my interest, as this one did, I seem to forget how to spit out a quickly typed review and instead log on to concentrate on silly diversions; making lists I can construct in a free moment and taking mental notes in rush hour traffic. I make mixtapes based on 90's teen movies and forget that new things are happening. I'm not the only one. It seems as though everyone has cinematic ennui in the spring. After the awards season onslaught, it's hard to care. This is when the crap flies into wide release, when Project X, Journey 2, and Ghost Rider can manage to make a few bucks. Knowing this, it's almost entirely unacceptable that Disney went and released the latest Studio Ghibli export right now. I mean, I'm tired, and The Secret World of Arrietty is too good for February; too good to warrant a half-assed review I have to force myself to find time to write. As you may have discerned, Arrietty is based on the world Mary Norton created for "The Borrowers." It's a pleasant reality in which tiny people live beneath the floor boards, in the walls, in the garden, and live off of the scraps left by humans. While they must scavenge for the supplies they need to live, they are not thieves. Their presence is negligible, a bayleaf can last a season, a spool makes for a durable piece of furniture. 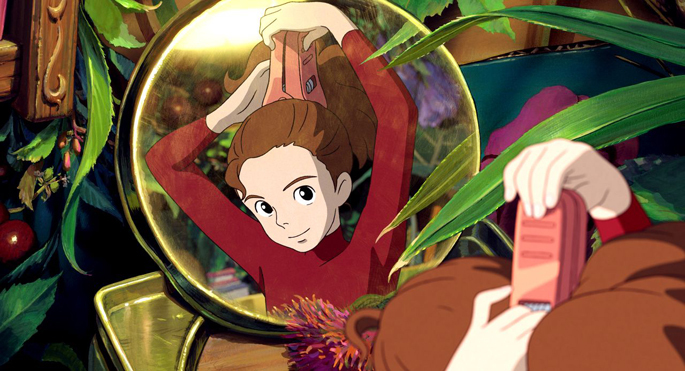 Our heroine, Arrietty Clock (voiced by Bridgit Mendler), is a 14-year old 'borrower' who has never met another of her kind outside of her protective parents (Will Arnett and Amy Poehler). Old enough now to begin to learn the ways of life outside of her small world, her father begins to teach her how to forage. On her first 'borrowing', he shows her the passageways throughout the house of the 'bigs' they live off of; they duck through illuminated dollhouses, crowded kitchen cabinets, and shadowed vents to collect a single piece of tissue paper, a carefully carted sugar cube, and a chanced-upon needle Arrietty is able to use as a makeshift sword. The world is not safe for Borrowers. They know they are a curiosity, a sort of sideshow vermin to be held under glass if captured. Consequently, Mr. and Mrs. 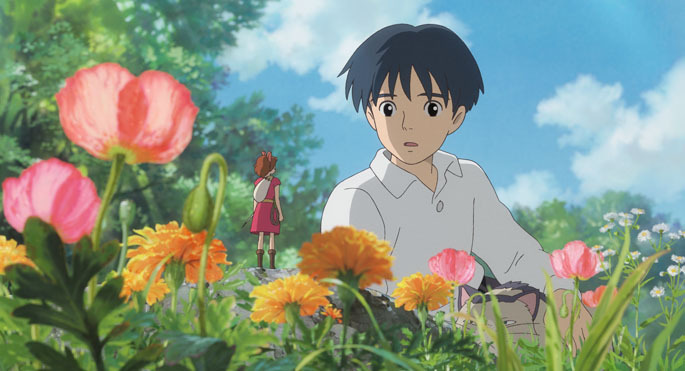 Clock don't trust the bigs, and encourage Arrietty to avoid contact at all costs when she is spotted by Shawn, a sickly boy who has taken up residence with his elderly aunt. As is often the case in animated fantasies, contact cannot be avoided, and a benevolent friendship between opposing forces feels somehow inevitable. While this film is directed by Hiromasa Yonebayashi, Ghibli auteur Hayao Miyazaki has clearly left an imprint on the film's very DNA. 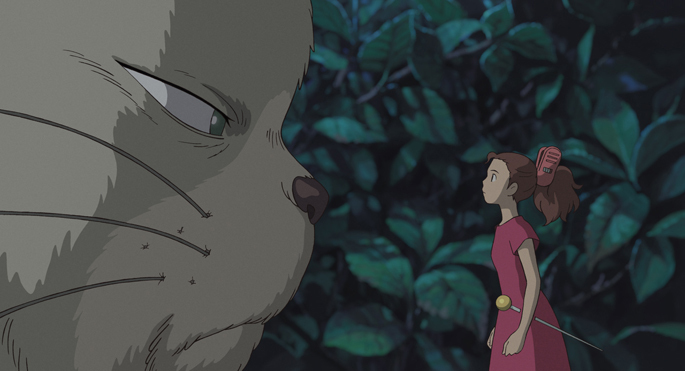 Arrietty stresses the importance of friendship and connection not only with one's own species, but with all creatures in the natural world. In Ghibli's moving storybooks our young heroes are always brave and true, children are always equal in each other's eyes, and our female protagonists (for, most of them are) are never relegated to a position as fugue-state princess or ailing damsel. There's a quiet magic in Arrietty's world, and while the plot may be familiar terrain, the film feels like a precious gift. In an early scene, we move from a lush garden into the tiny house of our small family unit. What we find there is positively breathtaking, a small, tightly enclosed marvel of colors, appropriated objects, and encapsulated nature hand-drawn in painstaking detail. It's in contrast to the airy, cavernous world of the human house, the human yard; a place where a postage stamp is a painting and wildflowers can transform a bedroom into a jungle. When we see it, we feel as though we have unearthed something, as if we now must wonder as to what has been lurking beneath the floors in our own closets. It's remarkable, and from that point on each small movement feels considered and not quite of this earth. Perhaps it's because these moments are not small, they are tremendous jolts to our sleeping imaginations. Let's just say, if Pixar is smart, they will have set out with Brave to do what Miyazaki and company have done repeatedly for generations: show us a world we want to get lost in and give us a heroine with a quest that matters.